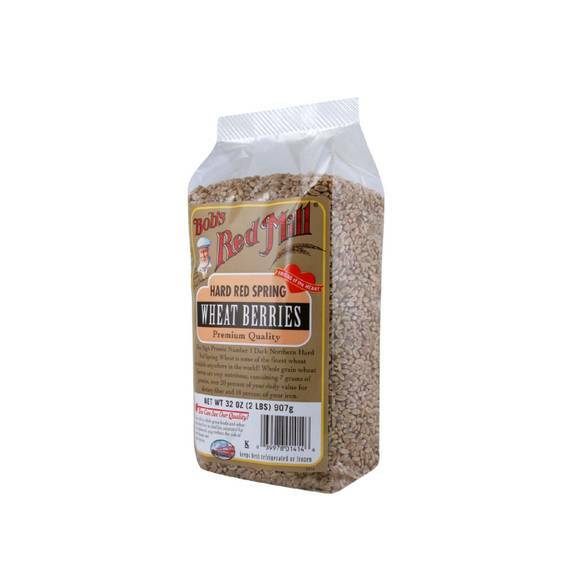 Bobâ€™s Red Mill, Grains, Hard Red Spring Wheat Is Some Of The Finest Wheat Available Anywhere In The World! This Product Contains 6 G. Protein, Over 20% Of Your Daily Value For Dietary Fiber, And 8% Of Your Iron. Each Â¼ Cup Serving Of Bobâ€™s Red Mill, Grains, Hard Red Spring Wheat Also Contains Only 150 Calories And Is An Excellent Choice To Add To Your Next Meal. Please See Nutritional Facts Panel For Information On Possible Allergens. Bobâ€™s Red Mill, Beans, Pinto Beans Are Manufactured In A Factory That Also Processes Soybeans, Milk, And Tree Nuts.